The map below displays the geographic distribution (UK) of respondents to the angling questionnaire survey, conducted in 2009. Respondent postcodes (n=1,996) were used to plot each orange dot on the map (note that approximately 500 respondents did not supply their postcode and therefore were not mapped). Each dot represents a unique postcode, although the scale of the map means that urban locations appear as a combined mass of dots. The primary purpose of the map is to display how successful the survey was in obtaining a sample that was representative of UK regions. The map shows particularly dense clustering of dots in the major conurbations, such as Greater London, West Midlands (Birmingham), North West England (Manchester & Liverpool), Yorkshire (Leeds), North East England (Newcastle) and Central Scotland (Glasgow and Edinburgh). However, the rural areas of the map, like South West England and East Anglia, also contain a healthy scattering of orange dots. These results suggest the questionnaire was quite successful in reaching anglers right across the UK. 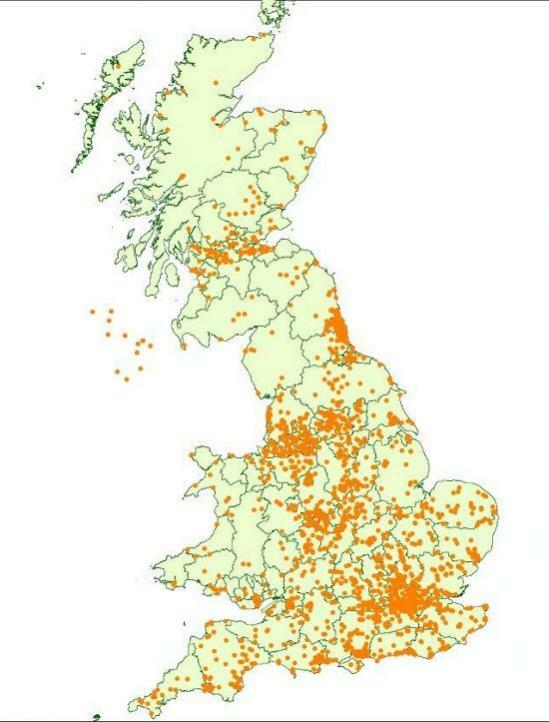 Indeed, there are even orange dots in more remote rural locations, such as the Scottish Highlands and The Hebrides.